The first glimpses of Princess Cruises' forthcoming flagship, Royal Princess, have finally come to light with the cruise line's first video on the new ship and announcements on the ship's facilities and first sailings. The 141,000 tonne ship will carry 3,600 passengers and the cruise line's largest ship has concentrated on more public space, as opposed to cramming in as many people as possible. The signature of the Royal Princess, and her yet to be named sister ship, will be the new, larger atrium and piazza. The atrium is 50% larger than other ships with similar capacity, along with new venues and more entertainment. The piazza will boast many of the popular current venues, such as Vines Wine Bar, the International Cafe and Sabatini's Italian Bistro, as well as new venues, such as the new designer Gelateria and Bellini's — an Italian inspired cocktail bar. Alfredo's Pizzeria, introduced to the cruise line after the Grand Princess, will also feature, but with a new, more extensive menu. As well as showcasing the new design and layout of this stunning new ship, Princess also announced that she will be arriving in June 2013 offering a variety of Mediterranean cruises from Barcelona and Venice. 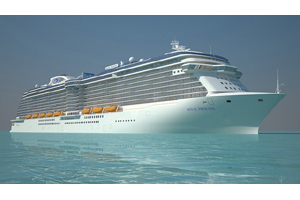 Though the Royal Princess will carry up to 3,600 passengers, she is nearly 30,000 tonnes heavier than the cruise lines current largest ships the Emerald class ships, which carry a similar number of passengers (3,100 standard capacity and a maximum of 3,600 passengers), making her public spaces much more accommodating and comfortable. The Royal Princess will definitely be up there with the finest ships to offer affordable luxury, going by this first video.